Unfortunately currently from oracle's site oracle-instantclient is only available in RPM and ZIP format. So Debian and Ubuntu users will have to install it either by downloading zip and unarchiving somewhere or using alien (deb rpm install) tool. I've been thinking for a long time. How computers and involved technology copy God's creation. This kind of thoughts poped up in my mind right after I became a believer. As I'm having a strong IT background I tend to view thinks in world via the prism of my IT knowledge. If I have to learn a new science my mind tend to compare how this translates to my previous knowledge obtained in IT. Probably some other people out there has the same kind of thinking? I'm not sure if this is a geek thinking or it is usual and people from other fields of science tend to also understand the world by using accommodated knowledge in field of profession they practice. Anyways since my days I believed in Jesus Christ, I started to also to compare my so far knowledge with what I've red in Holy Bible and in the book of The Living of Saints (which btw is unknown to most protestant world). It is very interesting that if you deeply look into how all Information Technology knowledge is organized you can see how Computers resembles the visible God's creation. In reality I came to realization how Moden Man self-deceives himself. We think with every new modern technology we achieved something new revolutionory which didn't existed before. But is it really true? Lets take some technology like Microsoft Active Directory (using LDAP) for example. LDAP structures data in a tree form where each branch could have a number of sub branches (variables). In reality it appears LDAP is not new it a translation of previous already existent knowledge in universe served in a different kind of form. Let me give some other examples, lets pick up the Internet, we claim its a new invention and from human point of view it is. 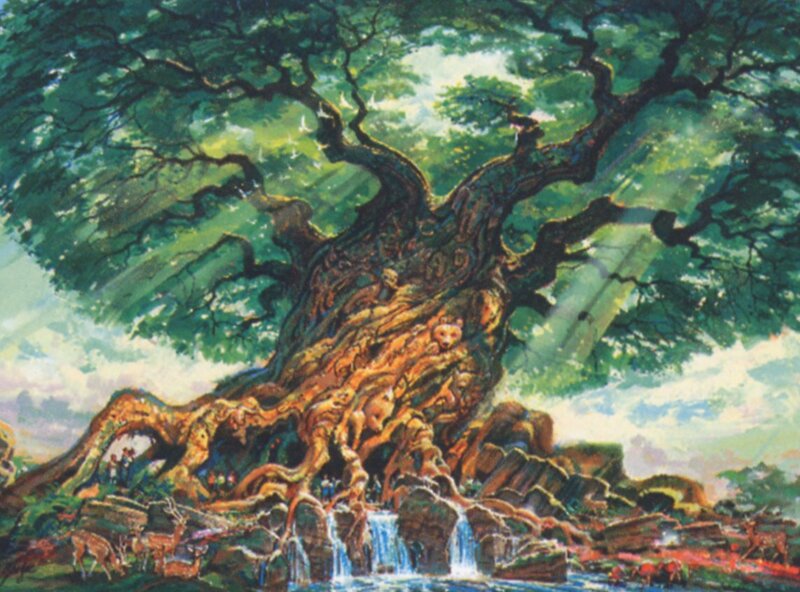 But if we look on it via the prism of existing created world. It is just a interconnection between "BIG DATA" in real world it is absolutely the same latest researches already know all in world is data and all data in world is interconnected. So obviously the internet is another copying of the wonderful things God created in material and for those who can accept (the spiritual world) world. Many who are hard-core atheists will argue that we copy things in the world but all the material world is just a co-incidence. But having in mind that the world is so perfectly tuned "for living beings to exist" it is near to impossible that all this life and perfection emerged by random. The tree structure model is existing everywhere in OS and programming. We can see it in hiearchy of a file system, we can see it in hashes (arrays) in programming and all this just copies the over-simplified model of a real tree (which we know well from Biology is innemous times more complex). Probably the future of computing is in Biotechnologies and people's attempts to copy how living organism works. We know from well from science-fiction and cyberpunk the future should be mostly in Bio-technologies and computer as we know it but even this high-tech next generation technology will be based on existent things. Meaning man doesn't invent something so different he does copy a model and then modify the model according to environment or just makes a combination of a number of models to achieve a next one. Sorry for the rant post but I'm thinking on this for quite a while and I thought i should spit it here and interested to hear what people think and what are the arguments for or against my thesis? I remember GNU / Linux, 11 years from now, times when ALSA was not standardly shipped with Linux. Back then ALSA still lacked good support for many SoundCards and was still a "baby project". In that time what we used to have sound on Linux was OSS – Open Sound System. OSS emerged right after the first ever Linux sound system VoxWare (formerly known as the Linux Sound Driver). Back in those days OSS was used for multimedia support on both GNU / Linux and BSD based free OSes. It was few years later when I heard and used ALSA for a fist time and it wasn't really a love from first sigth. One can easily find out by the name ALSA it is a system especially built for the Linux kernel and that's one of the reasosn why *BSD systems has their custom separate sound system. There is plenty of reasons why OSS was substituted with ALSA. Main reason was its commercial like license, OSS wasn't completely "open source" GPLed (free software), there was resctions on use of OSS for commercial goals. With its emerge ALSA started to push away OSS slowly. 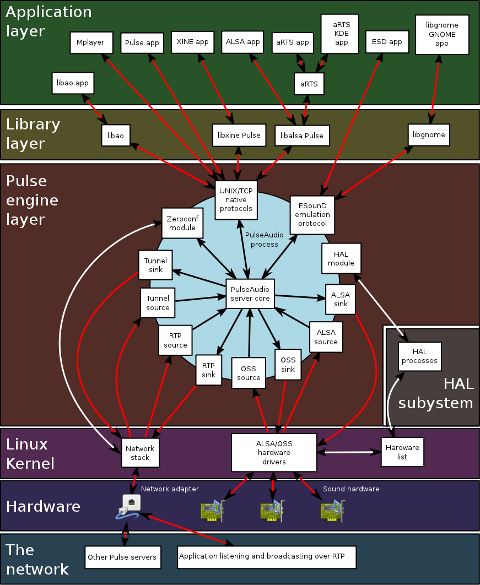 Somewhere in 2003, alsa has officially entered the Linux kernel source and until 2005 it was the default standard for all GNU / Linux operating systems. As of time of writting ALSA has become the only sound system to have support for multiple sound card devices for Linux. My experiences with ALSA, however ain't so nice if I take a look in my past experiences. Since the very beginning of using ALSA, I had plenty of troubles with configuring properly my sound card not to mention, even after configuring it the MIDI support was not there. Besides all the troubles main problems were stemming from the many applications still written to use OSS as sound system and hence with those sound was impossible with ALSA.The most problematic thing about apps written with OSS in mind was all of them tried to stream sound via /dev/dsp (OSS Digital Sound Processor), since alsa did not used /dev/dsp those programs was soundless. On the other hand OSS was creating issues as well, one severe problem with OSS was the inability to stream multiple sounds simultaneously, because each sound stream required to pass voice through /dev/dsp and usually there was only one /dev/dsp. and the proceeding irritation that used to annoy us in the early GNU / Linux days had of course some raw workarounds hacks but generally the workaround did not fix problems always. ALSA has modular structure and this imposes a great problem nowdays. The modular architecture is generally a good idea, however the way this was implemented within ALSA is far away from clear and easy to understand by the end user and therefore makes it very unintuitive and obscure. Alsa misses simplicity which somehow was partially in the days of OSS. 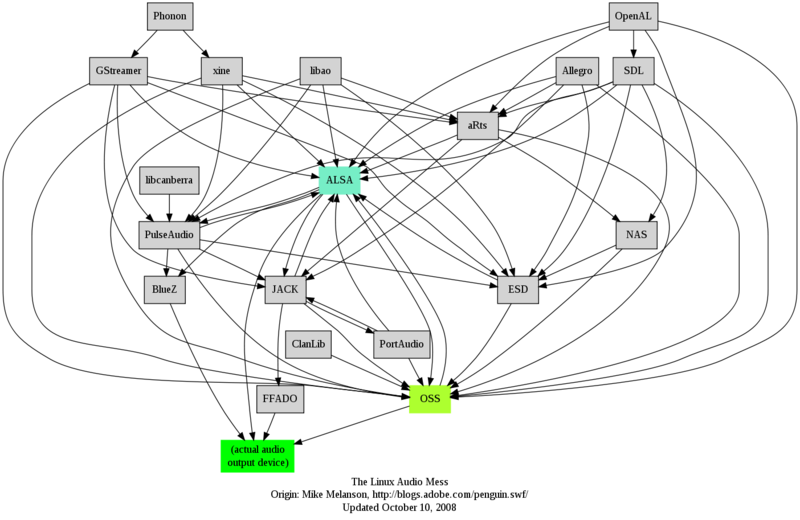 Thinking over the general situation with Linux multimedia nowdays, I believe it was exactly ALSA Project responsible for the so delayed mass Desktop Linux adoption. Many long year standing Linux users had certainly had the alsa troubles during new system installs (correct me if I'm wrong). The only fix to multiple soundcard initialization problems was to download alsa source and compile from source and hence made it hard and discouraging for people giving Linux a try. Hope some ALSA developers will read this post work on changing the crazy structure of ALSA over complexity. ALSA needs automate way to solve issues with itself, the configuration should be more trivial and unified if Linux has to become more attractive for Desktop adoption. Anyways, after the few words of history and indicating my pesonal observations on ALSA. I will proceed and explain few things on how ALSA can be configured to support and play nice with OSS dependant programs as well some basic explanations on common incompatibility between esd and pulseaudio and how this can be fixed;. The Linux sound situation becomes even more messy when ESD enters the scene. Many of the novice new Linux users certainly don't remember (Enlightened Sound Daemon) . ESD historically preceded PulseAudio . Hence it will be good to mention ESD was used for few years in GNOME and in around 2006-2007 it was substituted by PulseAudio. Many applications, however who was ported or written for Linux especially (the proprietary ported ones) was already built to work with ESD and even though newer GNOME releases was fully using pulseaudio, this (non free software apps and games) were still depending on ESD. The package for almost all Linux distributions which does the esd emulation via pulse is pulseaudio-esound-compat . In latest Fedora Linux pulseaudio-esound-compat is installed by default. padsp – is a PulseAudio OSS Wrapper. Another common problem with sound on Linux is when running windows applications (running windows games with wine). Quite often sound fails to work since wine tries to directly communicate with alsa and fails because alsa sound channel is taken by pulseaudio. This script was reported by many people as fix to problems with wine games failing to play sounds and music, anyhow I personally prefer using the stop / start pulseaudio method. Listing all table names from a MySQL database is a very easy and trivial task that every sql or system administrator out there is aware of. However excluding certain table names from a whole list of tables belonging to a database is not that commonly used and therefore I believe many people have no clue how to do it when they have to. Today for one of my sql backup scripts it was necessary that certain tables from a database to be excluded from the whole list of tables for a database I’m backupping. However as my desire was to exclude certain tables from the list (preferrably with a certain SQL query) I had to ask around in irc.freenode.net for some hints on a ways to achieve my exclude table goals. I was adviced by some people in #mysql that what I need to achieve my goal is the information_schema mysql structure, which is available since MySQL version 5.0. It seems using the information_schema is very easy and is not much different from your normal queries syntax used to do trivial operations in the mysql server. If you wonder just like I did what is mysql’s information_schema go and use the information_schema database (which I believe is a virtual database that is stored in the system memory). I used the limit clause in order to prevent being overfilled with data, where I could still see the table fields name to get general and few lines of the table to get an idea what kind of information the TABLES table contains. That will also give you a few hints about the exact way the MySQL works and comprehends it’s contained data structures. In short information_schema virtual database and it’s existing tables provides a very thorough information and if you’re an SQL admin you certainly want to look over it every now and then. A bit of playing with it lead me to a command which is actually a good substitute for the normal SHOW TABLES; mysql command. Of course this example can easily be adopted to a MySQL backup script which requires the exclusion of certain tables from a backed up database. Now this little bash one-liner can easily be customized to a backup script to create backups of a certain databases with a certain tables (e.g. with excluded number of tables) from the backup. It’s seriously a pity that by default the mysqldump command does not have an option for a certain tables exclude while making a database dump. I’ve saw the mysqldump exclude option, being suggested somewhere online as a future feature of mysqldump, I’ve also seen it being reported in the mysql.com’s bug database, I truly hope in the upcoming releases we will see the exclude option to appear as a possible mysqldump argument.